Between 1937 and 1963 the remains of three Bronze Age vessels were discovered at North Ferriby on the Humber foreshore. Bronze Age sewn-plank boats are unique to England and Wales. The longest were 16 meters in length and made of oak. The hull of the boat was made by stitching wooden planks together; this sewing technique was used as nails had yet to be invented. 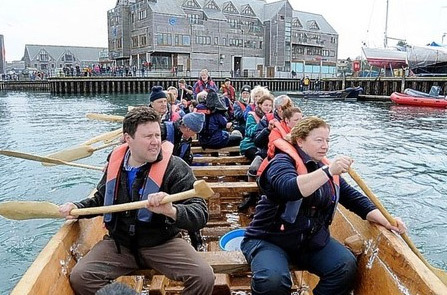 Academics at the University of Exeter, partner in OpenArch, along with shipwright Brian Crumby, with the help of an army of volunteers built a replica Bronze Age stitched boat at the National Maritime Museum Cornwall. The project was funded by the Arts & Humanities Research Council (AHRC). The work lasted from April 2012 up to March 2013 and was designed to find out more about the process behind building a sewn boat, to examine the seaworthiness of such vessels and to understand how it was built and sailed. The boat was successfully launched on March 6 2013. Details, starring Exeter archaeologist Dr Linda Hurcombe are in this BBC report. A wonderful series of time-lapse videos are on YouTube.